Best Lump Charcoal Guide - Because it's an Ingredient, Not just Fuel! Home Recommendations & reviews Best Lump Charcoal Guide – Because it’s an Ingredient, Not just Fuel! Best Lump Charcoal Guide – Because it’s an Ingredient, Not just Fuel! Most of us love to brag about our food. We put a lot of effort into it, and it’s our pride and joy. It’s good to see our family and friends enjoy a picnic table full of delights that we grilled. We take the time to select the best ingredients, took the time to buy the best charcoal grill, so why skimp on the charcoal? Be honest, how much thought have you given to the charcoal you use? It flavors the food, and different charcoals impart different tastes, so it truly is an ingredient in your recipes like any other. It breathes life into everything you cook, enveloping the meat with complex smoky tastes and aroma. It can make a big difference to your end result, so you really should pay which one you use some attention. In this article, we discuss some lesser-known facts on lump wood charcoal, how it’s produced, what it contains and how the one you choose can affect your food. We shall also delve into the things you should know and consider before purchasing your next bag: What to look for, what to avoid and why it’s important. We’re hoping that after this article, you’ll think very differently the next time you watch those glowing coals in your grill or smoker. Charcoal is made from natural hardwoods, burnt in an oxygen-free environment, containing about 89% carbon and at first glance, looks just like burnt or charred wood. The process is not as simple as it looks and it’s labor intensive. It takes about 1½ tons of wood to make a ¼ ton of charcoal or about 90 pounds of wood to fill a 15-pound bag. Manufacturers usually use tree limbs, short logs and sometimes scrap from saw mills. They burn them in a kiln without oxygen until all that’s left is the black carbon. Burning the wood in this oxygen-free fashion purifies it. The water, oils and volatile alcohol in wood vaporize as smoke, leaving behind the ‘clean burning’ black gold we know as charcoal. You can watch this video on how this British charcoal maker produces it to visualize the process. This is the way it’s been done for centuries. Long before we discovered the joys of backyard grilling, charcoal was essential for making gunpowder. Today, they still use it for gunpowder as well as cosmetics, carbon filters and a host of other products. Lumpwood charcoal is the most natural fuel you can use for grilling food. There are no additives or fillers, and this explains why it’s the preferred grilling method for most pit masters. Charcoal is the best choice when you have limited time to start the fire for grilling because it lights faster than briquettes and will produce hot glowing coals in just a few minutes. It leaves less ash and burns hotter than even the best briquettes or wood. Because lump is more reactive to oxygen, the flame and temperature are easier to control using the grill’s adjustable air vents. Lump wood charcoal is the best choice for fast high heat cooking when you need a sizzling sear on the outside and juicy medium-rare in the inside. Lump from some species of hardwood can get to burning temperatures as high as 1200° F.
However, this doesn’t mean you can’t grill or smoke low and slow, like pork chops or chicken. It’s a simple matter of adjusting airflow and hence the temperature using your vents. Most grill masters use lump exclusively these days for heating their smokers because it is 100% natural and will release a nice smoky flavor. It’s cleaner burning than briquettes, due to having no additives or filler ingredients. Furthermore, the smoke from lump is not as intense as raw wood which can often result in too intense a smoky flavor. Regardless, whether you want a hot grill fire or a low even heat for smoking, you need to buy a quality brand of charcoal. 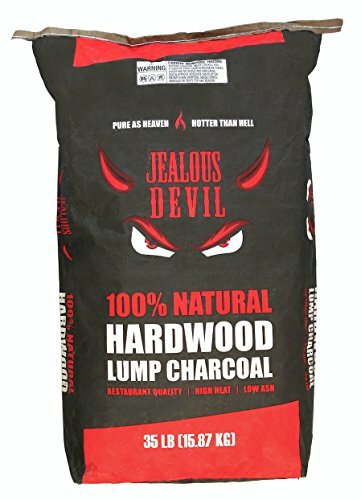 The best Lump charcoal should be all-natural hardwood, 100% pure, free from chemicals, fillers, binders and other additives. Good lump has similar sized pieces and little dust at the bottom of the bag. Superior quality has large pieces, burns longer and produces very low amounts of ash. You may sometimes find pieces that look like molding from a cabinet maker. That’s because it was, and that’s OK. Some manufacturers occasionally use sustainable sources like saw mills for slabs and edgings, and furniture factories to reduce dependence on forests and foreign sources. And that’s a good thing, right? Another sign of high-quality charcoal is no excessive sparking. While sparking makes impressive fireworks show at night, it’s dangerous and may mean your fuel has come from light weight wood that will burn too fast. It’s typical of discount brands. Also, a quality brand will not have foreign objects like nails, dirt or unburnt wood in the bag. One consideration when buying lumpwood charcoal is to find a brand that uses sustainable sources of wood. Most U.S. manufacturers use sustainable practices to protect the forest. It may not be so for brands imported from other countries. Some things to look for on the website or package are the Rainforest Alliance, FSC Certified (Forest Stewardship Council) or local compliance regulations. 100% of our raw material is waste-wood obtained from developing cattle farms. We work only with farms that have approvals from both SEAM and INFONA (environmental protection agencies of Paraguay), so you can be confident that 100% of the wood we use in our world-class charcoal is acquired legally and in accordance with all local conservation laws. Only buy locally sourced or environmentally sustainable lump to reduce the amount of illegal deforestation and help protect mother nature and our planet. A bag of lump usually contains a mix of oak, beech, and ash, the types of hardwoods found in furniture making. There is an abundance of scraps from lumber mills for a steady and renewable supply. Different wood has a different flavor profile, burning time and temperature. Finding sources for single species lump is not easy. Usually, your search results in briquettes mixed with one type of wood instead of lump. Nevertheless, one website, NakedWhiz.com has compiled a list of charcoal producers. Although it is a bit out of date, you can find some single species brands. You’ll find that some species are hit or miss depending on the time of year. One site had a banner that read, “Due to a lack of dead apple trees we are not shipping this item.” Check with your local barbecue and hardware stores for local producers. An alternative to buying single species lump is to make your own. All it takes is a barrel to make a kiln, time and trees. Here’s a good video on how to make your own charcoal if you have the time, would like to save some money and ensure there is only one species of tree. Just think of wood like wine. The lighter woods like fruit trees and maple provide a more delicate, “sweeter” flavor for white meats, typically poultry fish, and veal. The darker or heavier woods like oak, hickory and mesquite have a pronounced, strong flavor, and will work better for red meats and game. These characteristics are more important for smoking rather than quickly grilling steak or burger. Don’t spend the extra money for single species charcoal if you’re just cooking fast food. If you like to smoke meat, try different single species varieties to see which you like best. Some of these woods are available only as compressed pellets or briquettes from foreign suppliers. 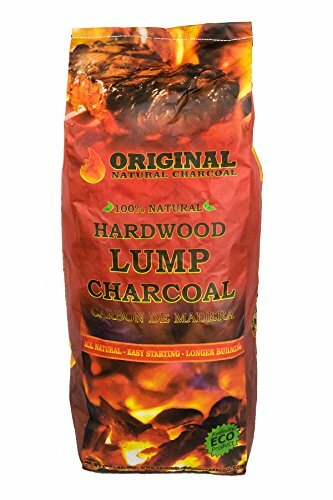 Try to search for “[wood] + lump charcoal” to see what you can buy. Here are some single species to try, provided that you can find them. Alder – West of the Cascade mountains, alder was used by the Northwest natives to smoke seafood and salmon. The Western Red Alder’s natural sugars provide sweet, smoky flavor. Apple – Apple wood is popular in the northeast and mid-west due to its availability. The smoke is delicate, making it an excellent choice for fish or pork. Beech – If you can find it, beech has a fragrant, musky smoke similar to hickory. Birch – A light wood that works for cold-smoking fish. The bark has a lot of pitch in it so it must be completely carbonized if you want to use it or it may have an acrid taste. Cherry – Cherry charcoal delivers a uniquely sweet smoke that’s perfect for a duck, chicken, and salmon. Chestnut – Popular in the U.K., Chestnut gives a mild, nut-like flavor. Hickory – Probably the best-known (and loved) wood smoke. This classic barbecue wood provides a strong flavor to anything you smoke, but it’s best for pork and beef brisket. Oak – This is the main ingredient in most lump charcoals. Oak imparts a strong flavor that can be more bitter than hickory. Some of these woods may be seasonal or localized, and may not be available in your area. If you can get them, they are worth trying to see the differences in flavor. So the take away from this is even if you use the same amount of coal, set up in your grill the same way, you may need to use different vent settings in order to achieve the same stable temps if using different charcoal. So please keep an eye on your vents to maintain the temperature you want for each cook. Most commercial lump is made from a mixture of hardwoods that are readily available to the manufacturer. For example, Cowboy brand says that their Southern Style hardwood blend comes from “southern hardwoods.” There are about 40 varieties of hardwood trees that grow in the southern U.S. that can be used for charcoal. With 21 species of oak alone, you’ll find this wood in almost every bag sold anywhere in the U.S.
Other predominant species are ash, hickory and fruit woods used in furniture and cabinetry making. These scraps make excellent charcoal and is why you’ll occasionally see pieces in the shape of molding in some bags. The larger the pieces, the longer and hotter they will burn. As you experiment with different brands, make notes of the consistency of the chunks from each bag. Pay attention to the amount of dust at the bottom of the bag too. Unless you are making water filters, you don’t want a lot of dust. It is useless for grilling, can cause sparks, and will clog your air vents. Look for large wood shaped chunks of uniform sizes. 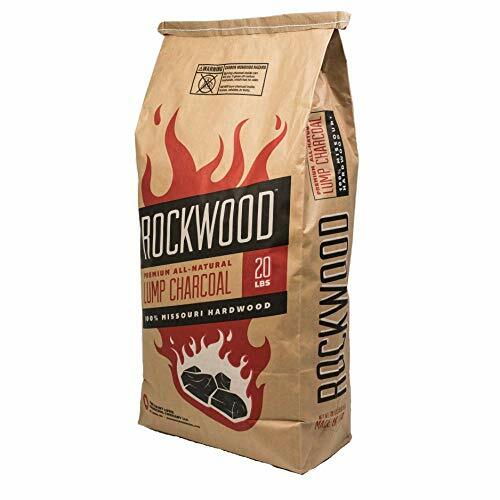 Make sure you see “Hardwood Lump Charcoal” or “100% All Natural” printed on the bag. Real lumpwood charcoal looks like little black replicas of logs and branches. It shouldn’t look like crumbled nuggets. Avoid brands that have excess dust and lots of small broken pieces. It could mean that bag was mishandled, or that the manufacturer is selling low quality product. You may need to try a second bag before ruling out the manufacturer because the store may be to blame. If you don’t know which to choose, try one of the folowing brands. They are high-quality and tested by experts around the country. Here is a mini-review of six brands that will make your next smoking or grilling an exceptional experience. We’ve scoured the web for 6 of the best natural lump wood charcoals that can be delivered nationwide (in the US), making them readily available for all. So, no excuses for using poor quality lump in future guys! 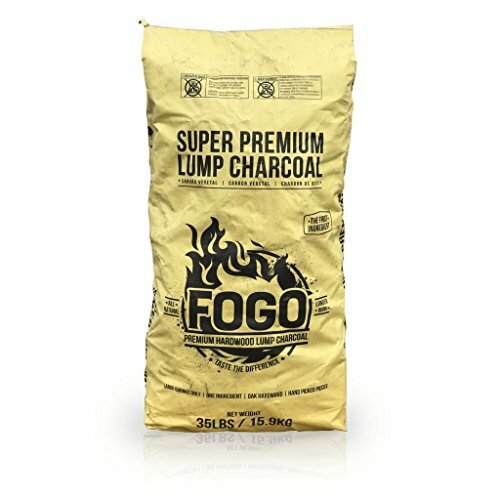 FOGO contains less than 5% chips and dust, very low compared to most brands, and why it is a standard item for many restaurants around the country. This fuel burns at a lower maximum temperature of 859°F (459°C) than other brands but still plenty of heat for any grilling purpose. A dense charcoal that burns for a long time. You’ll need a hammer to break some of the largest pieces into a usable size. Royal Oak has the USA emblem, and the description reads, “comes from renewable oak, hickory, maple and walnut hardwoods.” The bag we looked at had very little dust, which is a plus since you’re paying for the weight. The pieces were evenly distributed between small, medium and large. It works well in Kamado and ceramic grills. Royal Oak only lists two brands on their website, Star Grill Lump and 100% All Natural Hardwood Lump. The strange thing is both brands have the same description. 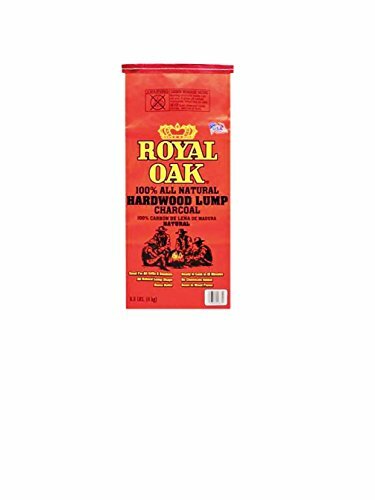 Other brands that Royal Oak packs include Chuckwagon, Grill Time, Big Green Egg, Real Flavor (Wal*Mart), Wegmans, Best Choice, and Nature-Glo. Some of these bags do not carry the USA logo and presumably come from Central American sources if you are concerned with sustainability practices. This brand uses “premium Missouri oak, hickory, and maple,” sourced solely from Missouri. Chips and dust were below 5% which is good compared to most brands. It produces little ash, long burn time, but a bit harder to light than other brands. The smoke is mild and would work well with poultry or fish. Lighting is a bit harder with this brand. You’ll need more paper in your chimney. Jealous Devil is made in Paraguay from a tree called Quebracho Blanco hardwood. This incredibly dense wood translates to “ax breaker.” The beauty of this dense wood is the heat it puts out. You can get up to 1172°F (633°C), which is higher than any other charcoal except maple or apple. The beautiful thing about this wood is there is no popping or sparks like you get with other hardwoods. Jealous Devil is sold mostly to restaurants in 35-pound bags, but you can buy it online. It has a high percentage of medium sized pieces, which makes a more consistent, long burning fire. The smoke is stronger than oak and may take a little getting used to. This type can be difficult to light needing up to 3 ½ sheets of paper in a chimney. We couldn’t do a review of lumpwood charcoal without adding a mesquite brand. We chose Lazzari because they use sustainable methods of pruning live mesquite trees or harvesting dead trees in the Sonora, Mexico region. It is 100% mesquite wood that imparts an intense smoke when first lit, but dissipates as the fire grows hotter. The bags contain a little more dust and fine pieces than we like to see in other hardwood brands, and the burn time is less than northern hardwoods. Although mesquite wood is a bit denser than oak, the max temperature when burning runs a bit lower at around 890°F (477°C). Mesquite lump gives you that unique Southwestern flavor. 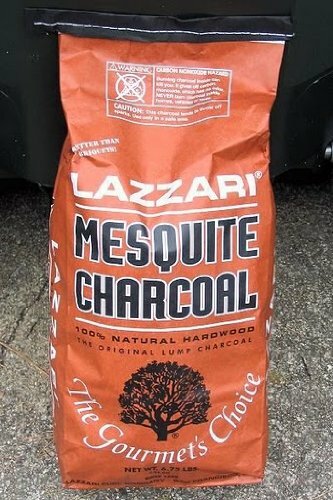 Lazzari mesquite charcoal comes in 6.75, 15 and 40-pound bags. Mild mesquite aroma, not overpowering. There was a lot of snapping, popping and sparks with this fuel. Mesquite charcoal burns quicker and produces more ash. A 17.6-pound bag of Original Natural Brand charcoal contains three types of wood, oak, apple, and cherry. The wood source comes from the Ukraine where the climate is perfect for oak and fruit woods. This brand is eco-friendly and sustainable because the wood comes from pruning the existing or downed trees. You can also purchase these brands on amazon if you can’t find them in your local store. Obviously, you want to keep your fuel as dry as possible. Placing the unused portion of the bag into a sealed container is preferable to just leaving it open in the garage to absorb moisture. If for some reason it gets wet, lay it out on a tarp or paper under the sun to dry for a couple of days. Charcoal will keep indefinitely, and that’s why archaeologists use it for carbon dating campfires that are thousands of years old. But, you need to keep your charcoal bone dry. Otherwise, it won’t burn properly and can become moldy, giving your food a bad flavor. Lump charcoal is the way to go if you like quality smoked meats or hot fires. Choose brands that use sustainable methods, has big pieces and is consistent from top to bottom of the bag. Lump charcoal works with any type of grill and lights quickly so you can start grilling or smoking in about 7 to 10 minutes. Each kind of wood will impart its own natural flavor characteristic to anything you cook with it, so do experiment with single species for variety. If you found this article interesting, please do share it with other grillers, especially those who use briquettes. Great post with tons of information! I do have one question Sir, can this type of charcoal be used for long cooks? Maybe you missed that part but I wanted to see how to use this stuff for cooks of 4 to 6 hour cooks. Thank you again and have a great day! I use Lump in my Kamado Joe Classic for low n slow cooks, and have regularly achieved 12 to 16 hour cooks, with no refill and some coal to spare. So yes, 4 to 6 hours is fine. However, if you are grilling hot n fast, lid open, lump does not last as long as briquettes as if open to the elements with a full oxygen supply, lump burns super hot n fast! Great for searing hot temperatures, not so great for extended lid off cooking. so you will need regular top ups. Hello there, great article. Down here in Southern Arizona we have El Diablo 100% Natural Mesquite charcoal. Haven’t tried the ones you suggested but you can’t beat El Diablo! Thanks for the comment, RKSmithy. I’ve not seen nor heard of them before. Do you find being a single species, mesquite charcoal they add a good smoky flavor, stronger than most charcoals? Top 10 Best Gas Grills for 2019 – Something for Every Need and Budget!